André Perugia, ad inizio 1951, si recò negli Stati Uniti per la collezione primavera-estate disegnata per I.Miller. La presentazione avvenne, secondo il New York Times, l'11 gennaio 1951. Per accompagnare la nuova collezione, Perugia portò con sé alcuni modelli originali creati nel corso degli anni. Alcuni giorni dopo, i quotidiani locali dedicarono maggiore attenzione ai modelli "storici". Nonostante la scarsa qualità della foto si riconoscono tra le altre: la scarpa "maschera" col tacco altissimo, (1949, datazione del museo di Roman; i coturni creati per Schiaparelli (1938), una variazione della décolleté di Eartha Kitt e la famosissima senza tacco (1937). At the beginning of 1951 André Perugia went to the U.S. for the spring/summer collection designed for I.Miller. According to the New York Times, the showcase took place January 11, 1951. Along with the new collection, Perugia brought with it some original designs created over the years. A few days later, local newspapers devoted more attention to the historical models. Despite the poor quality of the photos we can spot: the shoe "mask" with high heels, (from 1949 according to the Musée of Roman), the buskins created for Schiaparelli (1938), a variation of the décolleté for Eartha Kitt and the famous heelless shoe (1937). Delle scarpe raffigurate ce n'é una di particolare interesse (a destra nella foto qui sopra): un sandalo da sera portato con un rivestimento interno in seta rimovibile a piacimento: "per tener caldo il piede nel trasferimento", dice la didascalia. 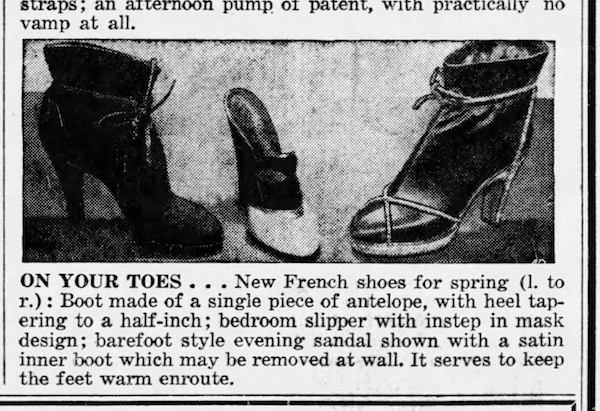 Among the shoes shown there's one of particular interest (picture above, on the right): an evening sandal "with a satin inner boot which may be removed at will. It serves to keep the feet warm en-route" reads the caption. Sull'idea di coprire il piede durante il tragitto, Perugia aveva già lavorato e successivamente brevettato un copriscarpa (1937). Non sappiamo se il modello portato a New York fosse nuovo o di anni precedenti. Sicuramente non è posteriore al deposito del brevetto del Kimo/spaghetti di Ferragamo (febbraio 1951) che tra l'altro era già andato incontro a controversie (rimosse dalla biografia ufficiale) circa l'originalità dell'idea. Covering the foot during the journey with an overshoe was an idea Perugia developed and patented back in 1937. 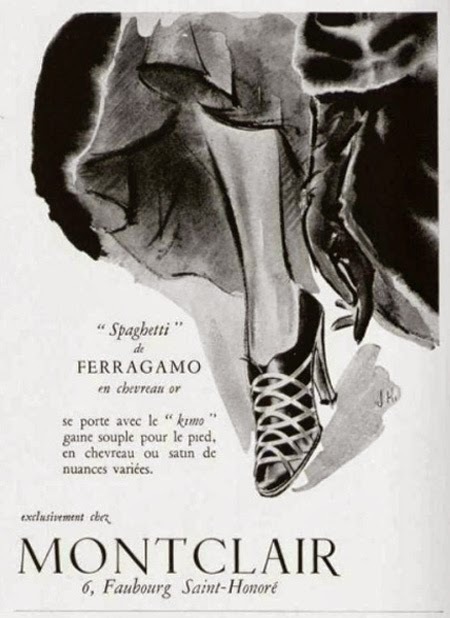 We can't say if the model brought to New York was new or made a few years back; it surely predates the filing of the Ferragamo Kimo/Spaghetti patent (February 1951) which, among other things, was going to be sued for plagiarism by the shoemaker Frattegiani (a fact removed from the official Ferragamo bio).